Digital pressure gauges have been around for decades, but until recently, they have become more relevant in industrial, laboratories, and testing applications than ever before. So, why the change? Here are a few reasons why digital pressure gauge usage has surged. 1.) Cost – The cost of digital gauges has dropped dramatically over the last 5-7 years. In the past, one might expect to pay around $300-$400 for a standard digital gauge with basic features. At that price, it didn’t really merit switching from mechanical gauges that could be purchased around $20. However, now due to technology and more efficient production, digital gauges can be purchased as low as $125 for high accuracy units or as a low as $15 for a real basic digital gauge. 2.) Availability – With costs being lower and usage going up, many digital gauges are being stocked in standard configurations instead of being made-to-order. This allows customers to have easier access and quicker deliveries on these products. 3.) Point-of-Reference Display – Its much easier to get an accurate reading by looking at a digital display instead of an analog dial. Think about looking at a mechanical clock vs. a digital clock. The reading is clear and concise. There is no “fudge factor” in the reading. 5.) 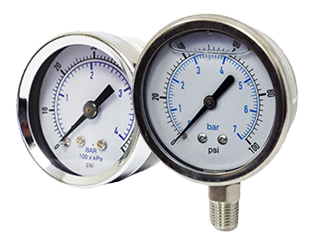 They’re Better – Digital pressure gauges are overall just flat out better than mechanical gauges. They’re more accurate in most cases, readings are easier to get, 4/20mA outputs are available, and digital gauges are more durable. One thing is for sure, digital gauges aren’t going anywhere anytime soon. Kodiak’s new KCDG15 digital gauge is perfect for reading pneumatic pressure applications where higher accuracy, better durability, and clearer readability is needed over a standard analog mechanical pressure gauge. The KCDG15 digital gauge is designed to be a better overall pressure gauge and provide a more reliable reading while still keeping the price much lower than a traditional digital gauge. 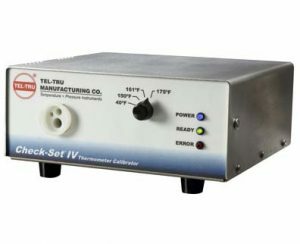 The KCDG15 is battery operated and can come in 1/8″ npt or 1/4″ npt threaded connections (other options available at request) and is 0-145 psi standard (other ranges also available). It is battery operated and has a 1.0% F.S. accuracy with LCD display. For further details, CLICK HERE for the product page and specification sheet. In this post on the Kodiak Blog, I wanted to briefly explain a few options that can be used to help legibility of the pressure gauge. Liquid Filling – Liquid filling the gauge with either a glycerin or silicone is easily the most popular solution and least expensive. The viscosity of glycerin or silicone makes it a thicker fluid than something water. With the case filled with glycerin, the needle has a harder time from shaking back forth from the vibration. This in turn steadies the needle and allows for accurate reading. In addition to help steady the needle, the glycerin also acts as a lubricant for the internals of the pressure gauge allowing for a longer life out in the field. Capillary Tubing with Diaphragm Seal – As an option for extreme vibrating applications where liquid filling and/or dampening movements aren’t enough, the pressure gauge is often mounted to a capillary tube and diaphragm seal filled system. 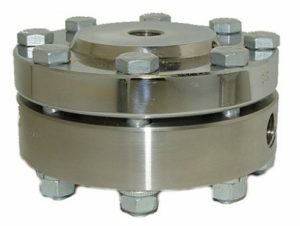 The diaphragm seal is mounted at the process connection. Capillary tubing (often 5 feet in length) is connected to the diaphragm seal and on the other end of the tubing is the pressure gauge. 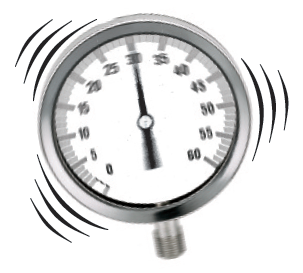 The pressure gauge is then typically mounted to a wall or panel away from the vibration and a proper reading can be seen. The diaphragm seal, capillary, and gauge assembly is filled with a fluid (often silicone), to allow for an accurate reading. 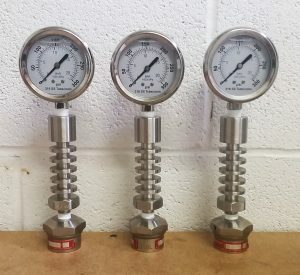 Standard specifications of pressure instruments, whether its a pressure gauge, pressure transducer, or pressure switch, are typically limited to the high temperatures they can see without experiencing faults in accuracy or potential failures. For example on a pressure gauge, the more common high temperature ratings are between 160F to 200F. And on pressure transducers, the ratings can be much lower due to the electronics. However, pressure still needs to be read on higher temperature applications. So, what can you do as an easy solution and is relatively inexpensive? Shorter in length than using straight pipe as an extension. Due to the Cooling Tower’s design, it allows for the heat to dissipate over a shorter length than a straight pipe would. This is great for space saving as well as stability of the instrument. 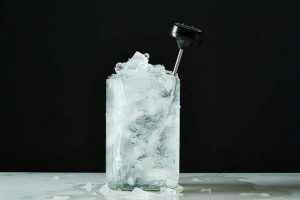 No pre-filling of water like you would have to do with a siphon. The cooling tower is just plug and play. Screw it into the process, put the instrument on the other end, and you’re good to go. It can be mounted to a diaphragm seal for added protection. 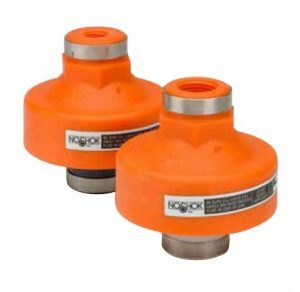 For applications using thicker medias that solidify at cooler temperatures or for high temperature corrosive applications, the use of a diaphragm seal is necessary. A cooling tower can act as a temperature barrier between the seal and the instrument allowing for accurate readings and eliminating clogs or corrosion of the instrument. Economical in price. With the features, durability, and accuracy a cooling tower can provide, it is certainly a great price conscious option. The photo provided above is an example we did at Kodiak using a cooling tower and mounting it to a diaphragm seal. Here’s a link to the specification sheet of a cooling tower to show the temperature ratings, sizing, and limitations. Measuring level for liquids, especially for corrosive and acidic applications, is not always cut and dry. Due to the caustic tendencies of the fluids, certain materials such as PTFE, CPVC, PVDF, etc. need to be used. Going the traditional route of using a float level transmitter or a capacitive level transmitter coated in PTFE or another chemical resistant material is certainly a good option. However, these tend to be very expensive and often don’t come with local indication if that’s desired by the end user. Another good option is to use a non-contact type level transmitter that uses ultrasonic technology. These instruments can be very accurate, have no moving parts, and can give the desired level readings. However, if the media gives off vapor or fumes, which acids can often do, the ultrasonic sound waves won’t reflect back to the transmitter properly causing a false reading. 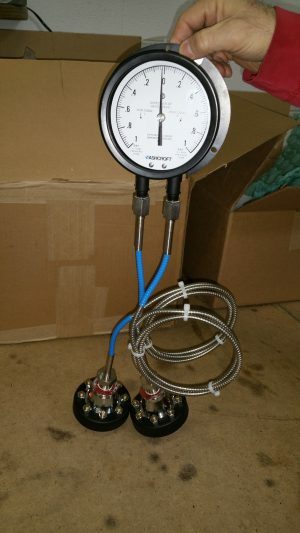 As a lesser expensive option, pictured in this blog is a level gauge Kodiak recently custom designed for a customer of ours who was trying to measure level of hydrochloric acid (HCL) in a 12 foot tank. Due to the height of the tank, we could utilize the atmospheric pressure by measuring the level using a 0-5 psi pressure gauge. However, because of the corrosive properties of HCL, we used a CPVC/PTFE diaphragm seal to isolate it from the gauge. 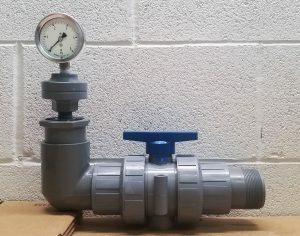 Then per the customer’s specifications we assembled the gauge to a 2″ CPVC isolation ball valve with a 90° elbow. 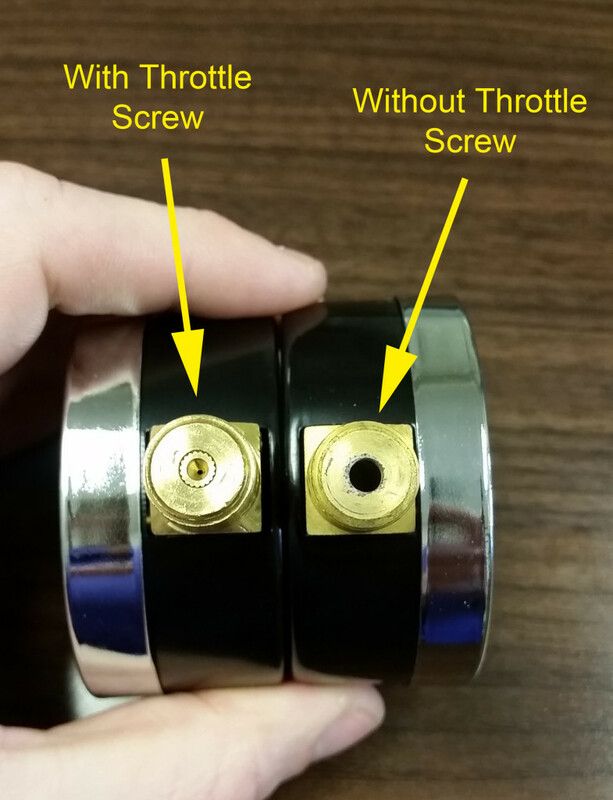 Then on the other end of the valve, assembled a 2″ socket by 2″ NPT connection to be screwed into the bottom the tank. 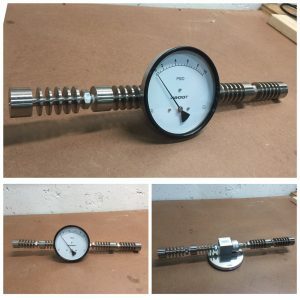 By using this custom level gauge, the customer can now accurately measure the level of the tank locally and relatively inexpensively compared to the other options. 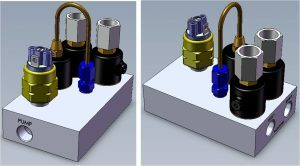 If a 4/20mA output is needed, a low pressure transducer can be used instead of the pressure gauge for future applications. The use of manifolds on any application is a great way to consolidate instrumentation and valves into one location. This not only saves space but also help eliminate potential leak points on the application. 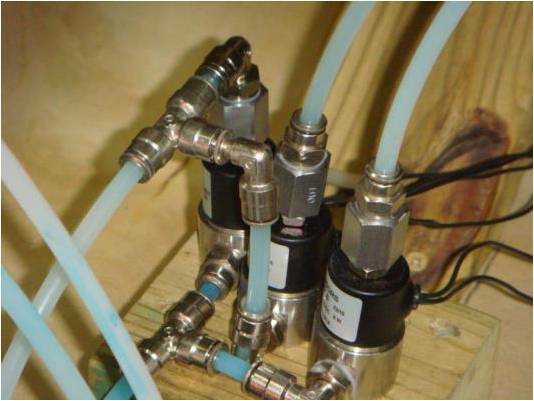 Below is a picture of a perfect example of an application using multiple valves and tubing,which not only is cluster of tubing and connections, but also a potential problem of leakage. 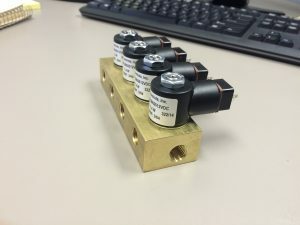 For more information on manifold valve designs and customization for your application please contact us by clicking HERE. For differential pressure applications with caustic or thick medias, mounting a differential pressure gauge directly to the process can be detrimental to the integrity of the gauge. The wetted material of the gauge may corrode away or the differential gauge could potentially become clogged. A solution to this problem would be to isolate the wetted parts of a differential gauge by mounting diaphragm seals made of a compatible metal or plastic to the inlet and outlet sides of the differential gauge. However, unlike a standard pressure gauge with one port, you cannot mount a diaphragm seal directly to the differential gauge because the ports of the gauge are typically too close together to accommodate the size of the diaphragm seal. A solution to this is to install capillary tubing in between the gauge and the diaphragm seal. 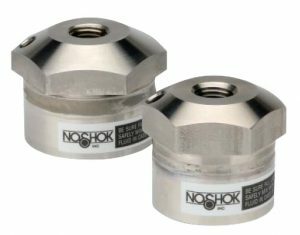 This allows for flexibility during installation, safety from high temperatures or vibration, and room for the diaphragm seals to fit on the gauge. The entire assembly is a filled system just like a standard gauge mounted on a diaphragm seal. The air is evacuated from the assembly and replaced with a fluid (usually silicone or glycerin). For more information on differential gauges and/or mounting instruments to diaphragm seals, please click here to contact us. A pressure instrument by itself typically has a small orifice for the media to enter into it for measurement. 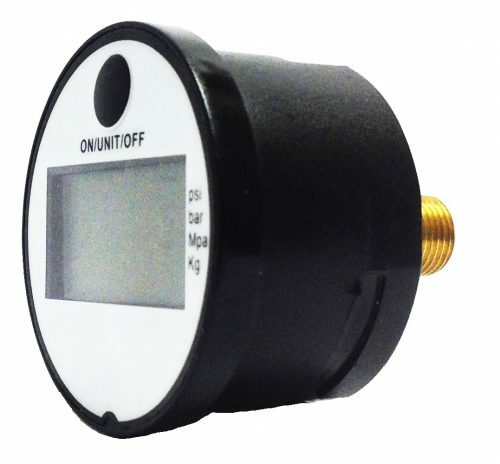 This works perfectly fine for applications such as water, air, or oil measurements. But what do you do if the media has solids in it, is thick, and/or solidifies when it cools that can potentially clog the pressure instrument rendering it useless? The answer is mount a diaphragm seal to the instruments. A diaphragm seal is specifically designed to be a barrier between the media and the pressure instrument. 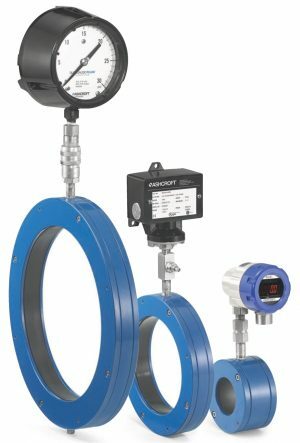 Pressure gauges, pressure transducers, and pressure switches can all be mounted to diaphragm seals (or gauge isolators as they’re sometimes called) through a “filling process” creating a sealed system between the instrument and the seal allowing for the utmost accuracy. IMPORTANT: You cannot simply screw on a diaphragm seal to a pressure instrument. As mentioned above, it needs to be a filled system. Essentially the instrument is mounted to the diaphragm seal. 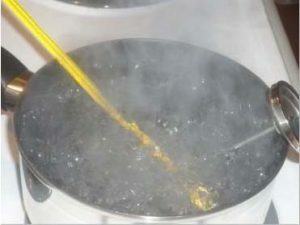 Then air is evacuated from inside the connection and replaced with a fill fluid such as glycerin, mineral oil, or silicone. This allows for an accurate reading.